I worked for many years in Cohoes, NY, a small river city north of Albany. Cohoes is rich in history and at one time well known for its textile mills which had long been abandoned during the stretch of time that I was employed in Cohoes. These looming giants have since been refurbished to upscale condos along the Mohawk and it is nice to see new interest in this charming city. 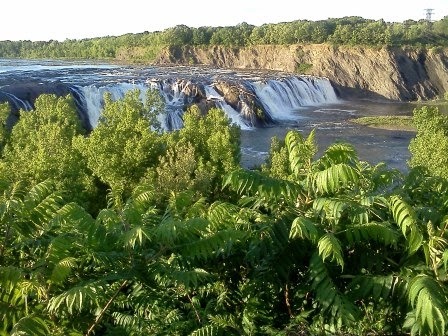 My position in Cohoes brought me through the city on a regular basis including Remsen Street, the main drag in Cohoes as well as trips up Mohawk Street along the (shocker) Mohawk River. Recently, I had the occasion to be traveling near Cohoes and decided to veer into town to see the city that I fell in love with years ago. True to my word, I made my pilgrimage to the falls in the spirit of worship. I was delighted to see that the falls were running heavy with water (sometimes these falls dry to a trickle). 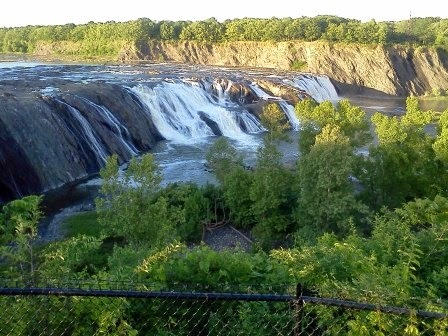 I was even more delighted to see that Cohoes has developed an area for viewing (Falls View Park)! Prior to this enhancement the viewing of this natural treasure was a small parking area near rough row house style apartments. Yes, there was parking, nice walking trails and informational bulletins. I should note that this area is only open during certain day hours. (I believe the main portion is open until 7pm and a path walking down to a lower viewing area closing an hour earlier). 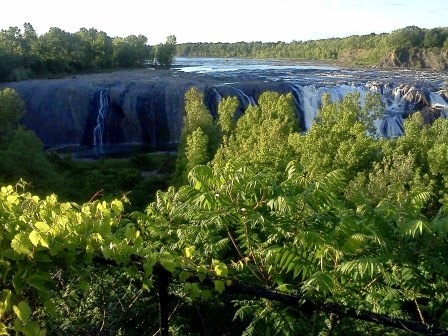 The beauty of these falls merits a trip if you are in the Albany area. It is a great choice for an impromptu picnic or quick getaway. As this was an unplanned, impromptu trip, my Go Phone was my only "camera" device, but I managed to capture some of the splendor of these falls. For those looking for additional things to do to roll into the adventure, I would suggest a stroll down Remsen Street or a swim at the very affordable community center (also at the end of Remsen Street), a visit to Peeple's Island, or a visit to the Waterford Locks. I was able to make a second visit to this hallowed ground and am adding some additional shots below. Above is the entry to the "old" viewing area on Cataract Street. If your time is limited or urban areas intimidate you, I would recommend the newer viewing area off of Mohawk Street (signage shown in photo below). The newer area also has a walk down area where you can get closer to the falls but as is noted in the park, you need to be prepared to walk back up the steps.